The Ormulum or Orrmulum is a 12th-century work of biblical exegesis, written in early Middle English verse by a monk named Orm (or Ormin). Because of the unique phonetic orthography adopted by the author, the work preserves many details of English pronunciation at a time when the language was in flux after the Norman Conquest; consequently, despite its lack of literary merit, it is invaluable to philologists in tracing the development of English. Orm was concerned that priests were unable to speak the vernacular properly, and so he developed an idiosyncratic spelling system to tell his readers how to pronounce every vowel, and he composed his work using a strict poetic meter that ensured that readers would know which syllables were stressed. Modern scholars can use these two features to reconstruct Middle English just as Orm spoke it. The name "Orm" is derived from Old Norse, meaning worm, dragon. With the suffix of "myn" for "man" (hence "Ormin"), it was a common name throughout the Danelaw area of England. The choice between the two forms of the name was probably dictated by the meter. The title of the poem itself, "Ormulum", is modeled on the Latin speculum ("mirror"); it can be interpreted as either the boastful "Reflection of Orm" or the modest "Researches of Orm". 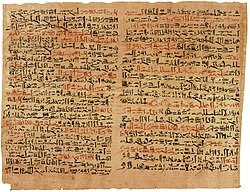 The Edwin Smith Papyrus is an Ancient Egyptian textbook on trauma surgery, written in hieratic around the 19th century BC, but thought to be based on material from a thousand years earlier. It is the world's earliest known example of medical literature. After a 244-year span in print, the Encyclopædia Britannica will discontinue its published volumes. With less than 1% of revenue coming from print versions, Jorge Cauz, Britannica's president, indicates there simply is not sufficient demand for the print publication. In the last 11 years demand has plummeted due to competition from Wikipedia and Britannica's own digital version. Britannica peaked in sales in 1990 with 120,000 sets sold. The 2010 edition will be the last in print and has sold 8,000 sets to date; with 4,000 sets remaining. Chinua Achebe , born Albert Chinualumogu Achebe on May 12, 1930, is a Nigerian novelist, poet and critic. He is best known for his first novel, Things Fall Apart (1958), which is the most widely-read book in modern African literature.Raised by Christian parents in the Igbo village of Ogidi in south Nigeria, Achebe excelled at school and won a scholarship for undergraduate studies. He became fascinated with world religions and traditional African cultures, and began writing stories as a university student. After graduation, he worked for the Nigerian Broadcasting Service and soon moved to the metropolis of Lagos. He gained worldwide attention for Things Fall Apart in the late 1950s; his later novels include No Longer at Ease (1960), Arrow of God (1964), A Man of the People (1966), and Anthills of the Savannah (1987). Achebe wrote his novels in English and has defended the use of English, a language of colonisers, in African literature. In 1975, his lecture An Image of Africa: Racism in Conrad's "Heart of Darkness" became the focus of controversy, for its criticism of Joseph Conrad as "a thoroughgoing racist". ...that before the invention and adoption of the printing press, almost all books were copied by hand, making books expensive and comparatively rare? ...that biggest book in the world is Bhutan: A Visual Odyssey Across the Last Himalayan Kingdom by Michael Hawley, which measures 1.5 m x 2.1 m (5 feet x 7 feet? Find news articles regarding notable books and add them to the "In the news" section. Create new articles: Lists of books provides a comprehensive list of notable books, many of which have no articles. Anything else you can think of doing.